We offer wide range of Ultrasonic Immersible Transducers. These ultrasonic machines are very efficient in cleaning application. 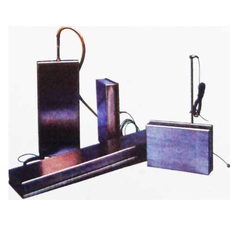 Also we have different types of ultrasonic machines catering to different applications. We offer Ultrasonic Immersible Transducers. Immersible transducers can be place wherever you need in you existing tanks. This units gives you complete freedom to design specialized cleaning setup. (Upgrade pre soak tank with Ultrasonic Immersible transducers). Each immersible transducers is fabricated from 304 / 316 stainless steel. With welded seams & stainless steel fitting these hermetically sealed modular component are available in standard sizes. Other size can be custom built for special application for more space saving. Flat transducers plates can be built into the tank bottom or side walls. Looking for Ultrasonic Immersible Transducers ?